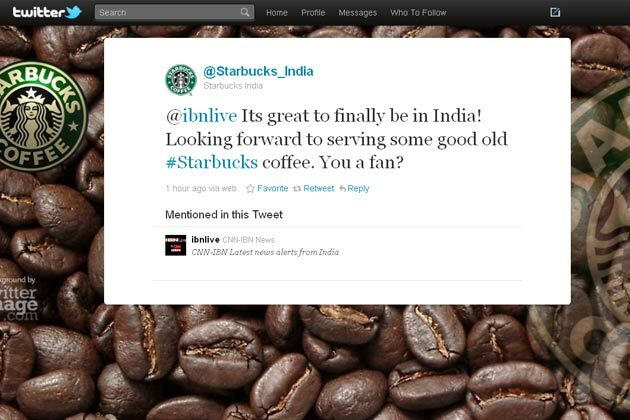 Starbucks Coffee coming to India. Soon! It’s really interesting how this superb brand has once again used the social media channel and informed the brand lovers and news channels about their launch plans for India. Because none of the newspapers this morning carried the story, probably means there was no official press conference to announce the launch. And they’ve already started a consumer engagement initiative even before they open the doors to their 1st cafe in India. But with a launch plan of September only, will they be able to keep up the buzz online, I think there will be some more learning from this brand. For those wanting to know when – my twitter timeline tells me that it’s expected only around September this year. Which city? Well, your guess is as good as mine. But fans on twitter are putting their bets on Mumbai. And I think it could be Mumbai / Delhi or surprise winner could be Bangalore. If you’re interested start following their twitter timeline and keep up with the buzz. With Starbucks, which is the most awaited chain of coffee shops coming to India, I am sure there will be such a mad rush that they might just be the first coffee shop to take reservations. I think all this while one of the primary reasons for their delayed entry into this Asian country has been the prohibitive property costs. And whether the Indian consumer was willing to splurge on such high-end expensive coffee experiences. But I suppose with the success of Costa Coffee and The Coffee Bean & Tea Leaf we’ve have seen a positive attitude to enjoy high priced coffees. And now soon, we shall have one more to enjoy. So, how much are you willing to pay for a Starbucks cup of coffee in India? i jst read ur blog…. It appears that the Twitter account’s been suspended!